Hear ye, hear ye, gallant knights and fair maidens! Pirates and peasants converge on the magical anachronism of Arizona Renaissance Festival and Artisan Marketplace in effect now through April 2nd, 2017. Full of whimsical and delightful surprises, it’s an experience that can’t be matched in this century. The Arizona Renaissance Festival is a medieval amusement park, a 13-stage theatre, a 30-acre circus, an arts and crafts faire, a jousting tournament and a feast all rolled into one non-stop, day-long, family adventure. The festival is one of the most interactive entertainment shows ever created with wonderful amusements and antics. Enjoy non-stop entertainment including comedy, music and dancing. Sit back and relax or become a part of the action as you are surrounded by over 2,000 costumed characters roaming the festival village. This Ticket Tuesday, we give away passes for the amazing Arizona Renaissance Festival. 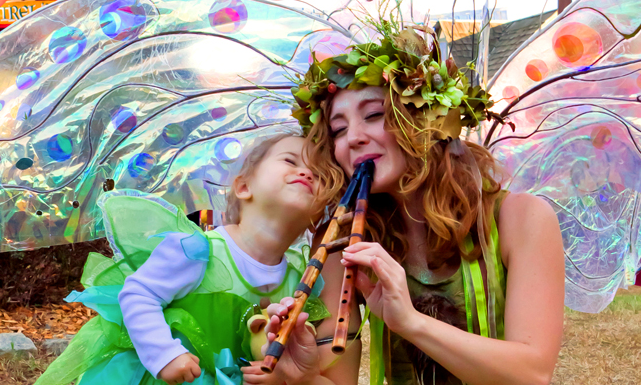 Arizona Renaissance Festival is more than an interactive and delightful event. The Festival incorporates outreach elements to local schools. Teachers who wish to experience a distinctive field trip opportunity can step into the world of royals, peasants, Galileo, Medicis, Shakespeare and Magellan to study language, science, arts and engineering up close during Student Days. In addition to outreach, talented artisans are featured at the village marketplace. With over 200 shops, it’s an adventure to find unique hand made items such as blown glass, premium leather goods and jewelry. Actually I’d want to see the future and know that the world will become a better, more tolerant place than it is today. If I had to go to the past I’d like to go see David Bowie in concert in the late 70s or early 80s! I would love to visit the Elizabethan era, just for a chance to see the monarch. I would also be interested in visiting early America before European Settlers and visit the Dinosaurs of course! Victorian England to experience Jane Austen’s world, specifically, the Lakes district! It’s beautiful now (at least in pictures!) so it must have been incredible then. Shakespeare the hell out of this! Bet this place needs another fool. I could be that guy! I would love to meet Tesla and see all those awesome creations! I’d like to see the 1920s, so i could see what both sets of grandparents were like when they were young. Would love to hang out in the 50’s. I would love to visit the 1950’s and 60’s in the United States. Maybe even the 70’s. Ooh! Woodstock, 1969! I’d visit late 19th century Europe, and visit the coffee shops of Vienna, to share in philosophy and mathematics at Cambridge, and visit with great authors like Virginia Wolfe. I would go back to the roaring 20’s I love the parties and amazing clothes. I would visit the 1950’s when life seemed simpler. I would love to actually go back to the Medieval times. See a real tourney and festival, no holds barred. If I could time travel, I would go back to the 1920”s so I could be a flapper. Mingle with the eccentric like F. Scott and Zelda Fitzgerald while dancing the Charleston. There were so many great inventions that decade like the Jukebox, television, the first radio station. It was a era of blossoming. I would like to visit Henry VIII. He has always been fascinating! Divorced, beheaded, died, divorced, beheaded, survived! And I would try not to get gout. If I could command a time machine, I would go back to the Victorian Era when modern science was in it’s infancy and all things were possible. I would like to go back to the 70’s.